Comfort meets decadence in this dish from elements at Sanctuary on Camelback that would be perfect for Super Bowl celebrations for a romantic at-home Valentine’s Day. Boil lobster in salted water for five and a half minutes. Remove lobster, and submerge in an ice bath. Cook pasta in boiling salted water for eight minutes. Strain pasta onto a sheet pan, drizzle with olive oil and let cool at room temperature. Remove lobster meat from shell, set claws aside and roughly chop remaining meat. Reserve lobster shells. Place large sauté pan on medium-high heat. Add two ounces of butter, and sauté shallots lightly. Add fresh peas and lobster meat. Once lobster and peas are warm, add pasta and deglaze with eight ounces of lobster broth. Allow three to four minutes for sauce to come to a simmer. Sauce should start to coat the pasta. Add mascarpone cheese and fontina cheese. Season with salt and pepper. Taste for flavor; more sauce can be added based on personal desired consistency. 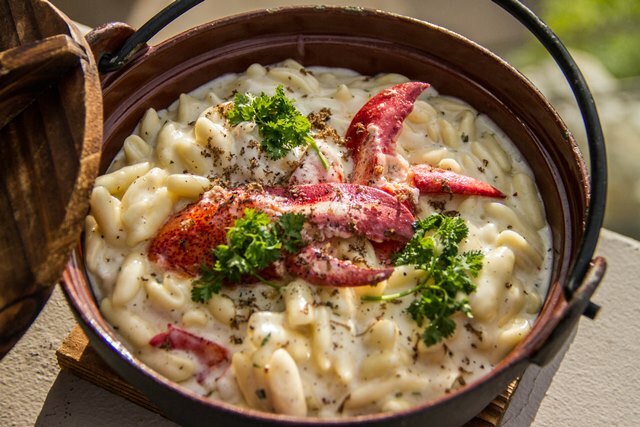 Place lobster mac ‘n cheese in a buttered casserole dish, and cover lightly with bread crumbs. Bake in the oven at 325 degrees for five minutes. Remove from oven and garnish with shaved black truffle and parsley. Yield: four servings. Place a medium-size sauce pan on high heat, and add olive oil, lobster shells and tomato paste. Cook for a minute and half; shells should turn dark red. Add chopped tomatoes, carrots, and tarragon. Deglaze with cold water. Bring water to a simmer and cook until water is reduce to one-third. Strain shells and reserve liquid. Add heavy cream and reduce to a desired consistency. Season with salt and pepper. Yield: 12 ounces.